• Restart both router and GULFSIP. 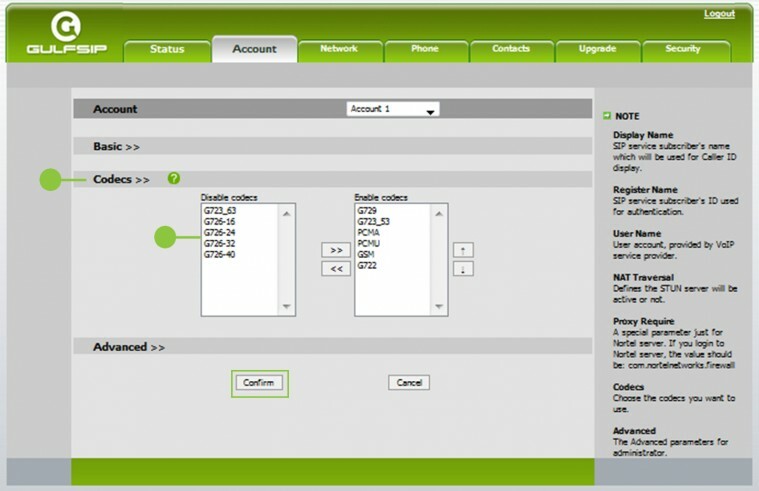 • Change port by opening interface page of the device and set “Local SIP port” to 6000. • Follow configuration as shown below. • To open device interface page, push the “ok” button and you should see the IP address of the device then type the IP address in the address bar of your internet browser on a computer in the same network as shown in Interface page (User: var Password: gulfsip). o Use G.723 for low internet speeds. o Use G.729 for medium internet speeds. o Use PCMU & PCMA for high internet speeds. • Change “Local SIP port” to 6000. • Change codec depending on you internet speed as previously explained.